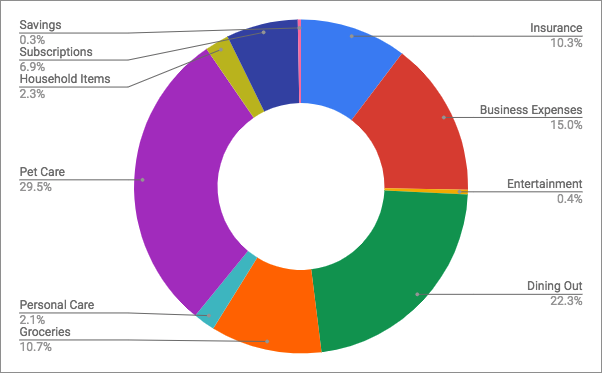 Welcome to our first weekly spending report! This is the first week of actively tracking our spending. I have always tracked our spending as sort of an afterthought, never really paying attention to it until I was looking for data. Usually, so I could beat myself up for letting it get out of hand. I’m looking forward to the daily tracking so that we can be more mindful of what we’re spending at the moment. That said, we didn’t really make any effort to spend less than normal since we wanted to see what our “normal” really looks like. The one thing I can say is that I know we eat out too much. July has been a large spending month on pet care. We sent Parker to a three-week board & train. So between the cost of the program itself, her vet and grooming appointments before we sent her off, and training supplies needed to continue with her, we spent a fair chunk more than usual in the pet care category. This week was the last bit of that, so spending in that area should simmer down to a more normal amount. Second, we spent twice as much dining out this week as we did on groceries! And this isn’t really out of the norm for us, I don’t think. We really need to evaluate why we choose to eat out so that we can counteract that habit. It looks like we cooked Monday and Tuesday and that was the end of our meal plan. Wednesday was crazy, and we didn’t make time to meal plan and grocery shop, so instead, we ate out. On Thursday we finally got the shopping done, so what was our excuse for dining out on Friday and Saturday? That said, I do see something unexpected: only one coffee house visit! Though there were actually two, on Thursday it was a Starbuck’s run where we used Rewards I had saved up and got both drinks for free. We have determined that not dining out at all is unrealistic given our current living situation. We’ve previously discussed limiting it to one dinner a week and lunch only when we’re traveling out of town. We also need to keep the coffeehouse runs down, but I have come to treasure what we call our “board meetings” as it’s a great chance for us to have a mini-date. Other than the dining out thing, I was actually pretty pleased with how we spent our money this week. Both personal care items that were bought were things that were sorely needed. The handful of household items picked up were for Josh’s mom and since they are graciously allowing us to stay with them, I don’t mind that one bit. I’d say the only questionable purchases were the movie rental (I’d just read Julie & Julia and wanted to watch the movie version) and the Calm App subscription (I’ll talk more about that in a minute). So the other thing I want to check in weekly on to keep myself accountable is the habits I’m working to build. I built myself a little habit tracking worksheet, and I did really good tracking everything…until Friday. That’s right, I lasted a whole four days. So what am I tracking? And how did I do this week? That by Thursday afternoon, I am thoroughly running out of steam. I recently read an article that talked about how we have weekly energy cycles as well as daily ones, and this is really helping me see that. I’ve always known that on Tuesdays and Wednesdays, I’m exhausted by mid-afternoon because those days are full of calls, but I hadn’t realized how my week is catching up to me. Hopefully, I can take this into account as I plan the upcoming week. Also, I am not motivated to exercise. Not at all. It’s so hot outside right now that it saps my desire to do much of anything. That said, now that Parker is back from her board & train, getting her out for a walk every morning is a priority. It’ll be good for me and it will help continue her training. I’m a little disappointed that I faded off on the meditate and read daily goals. Last week I downloaded the free trial of the Calm app and it was going great, so I didn’t cancel the trial. I had a seven-day streak going until Thursday. Hopefully having invested in the app will motivate me to keep using it (granted, it didn’t work last year when I paid for the Headspace app). And reading, I think I know what happened here. I’d been doing really good all month. In fact, I think I’ve read more books in July than I’d read most of the year combined. But when I wasn’t feeling well earlier this week, I downloaded a new game to my iPad and started playing that instead of reading. Increased game playing and Netflix watching results in decreased reading and French practicing (I recently rekindled my love of the Duolingo app). And I think it’s affecting my sleep as well since those activities aren’t nearly as relaxing. I’ve already gotten some feedback from people around me that all of this tracking is a little bit crazy and sharing it is even crazier. And I see where they are coming from, but I there is so much benefit to be had here. All of the time I come across blogs, and articles, and books where people talk about how they got out of debt or made big life changes. They can be motivating and inspiring, but the problem is that almost every single one of them is written after the fact. Very rarely is something written from the perspective of being in the mess of it. I used that as an excuse not to put this out there. That I shouldn’t write about this journey until I’ve moved much closer to success. But then I thought about it and realized that the person whose story resonated with me the most was someone who shared through her mess. I could see myself in that and didn’t fall into the trap of measuring my beginning against someone else’s end. See, the thing is, when we achieve something, even if it was tough to get there, we immediately start minimizing the struggles we went through. We don’t want to remember that. And if we wait to share our stories until we’ve achieved our perfect results, we (usually unintentionally) forget to share the struggles. We need to share the struggles. Sharing what we accomplished through rose-colored lenses doesn’t serve those who are behind us on the path. It’s like saying “Hey, the view up here is absolutely breath-taking,” but forgetting to mention the sinking mud, poison ivy, or the broken step in the rope bridge. Sure, they might take a different path, but I bet they still face some of the same obstacles, and as humans, we’re meant to lend a hand. We serve no one when we fake perfection. And we don’t serve ourselves when we seek perfection either. Nothing we go after is going to come without hard work and hiccups. I’m not looking to meet by habit tracking goals at 100%. I’m pretty darned happy* with my 60% average this week. And my goal for this week is just to beat that my a little bit. 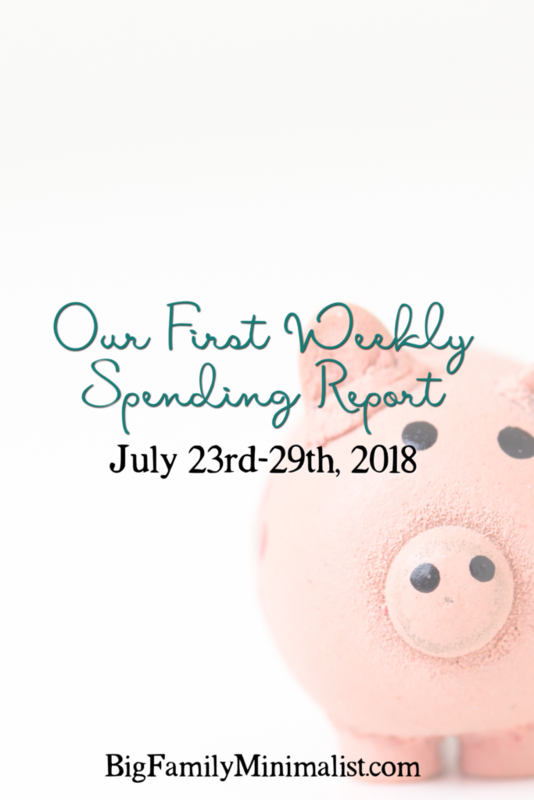 Our spending wasn’t perfect this week, but it sets a baseline and I can aim to do a little bit better next week. *And a little confession on that front: there’s a lot of rewiring going on for me. I want to seek perfection. I’ve always been that way. I never wanted to settle for less than an A in school (no, not even an A-). And I have a really hard time accepting broken streaks. I’ve always been a quitter when I miss one day of a new habit. Being happy with being less than perfect this week is not something that comes naturally with me. It’s a new thought process that I’m actively rewiring myself for. I’m actively countering every negative thought that pops up about it, actively choosing to not beat myself up over it, actively choosing to happy that I’m seeing progress, not perfection. I hope that sharing my journey in its imperfection will help someone else find the energy to start theirs. Or encourage somebody already on the path to keep going. And I hope that next year when I’m writing the success story of this journey, I don’t minimize the hard parts. I’m going to be honest, folks, this is scary and uncomfortable. I can remember yelling loudly about an A-. I call myself a “Recovering Type A”. I don’t know that you can every stop, but you have to admit that you are in the grip of perfection and want to make amends to those you’ve hurt. I’m also now MUCH better at just using my Type A powers on things that really matter to ME. I’ve been known to use “Recovering Type-A” or “Recovering Perfectionist” from time to time. I don’t think it’s something that ever goes away, but admitting it’s there and choosing to be mindful of where those powers are used is extremely helpful. I’m working on prioritizing what areas of my life can be deemed “good enough” and what areas deserve my Type-A Attention.